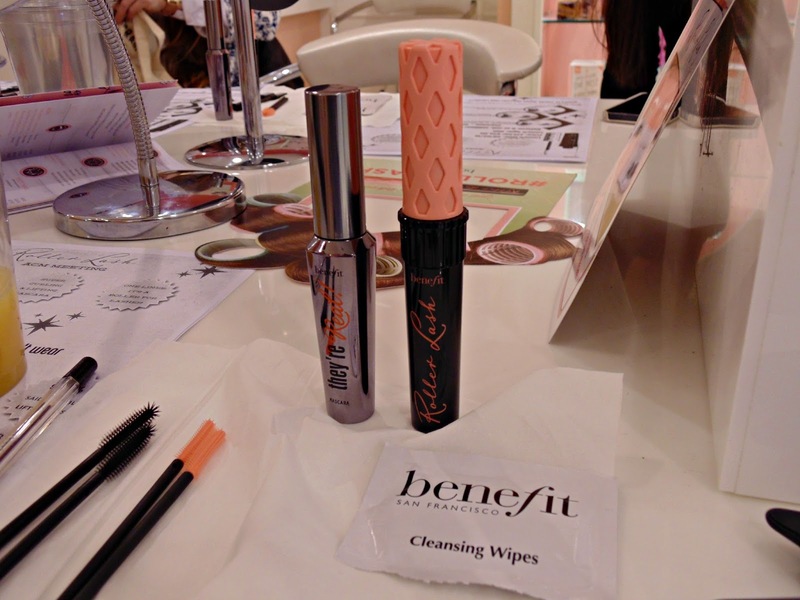 Last Thursday I attended a launch event for Benefit's brand new mascara; Rollerlash. 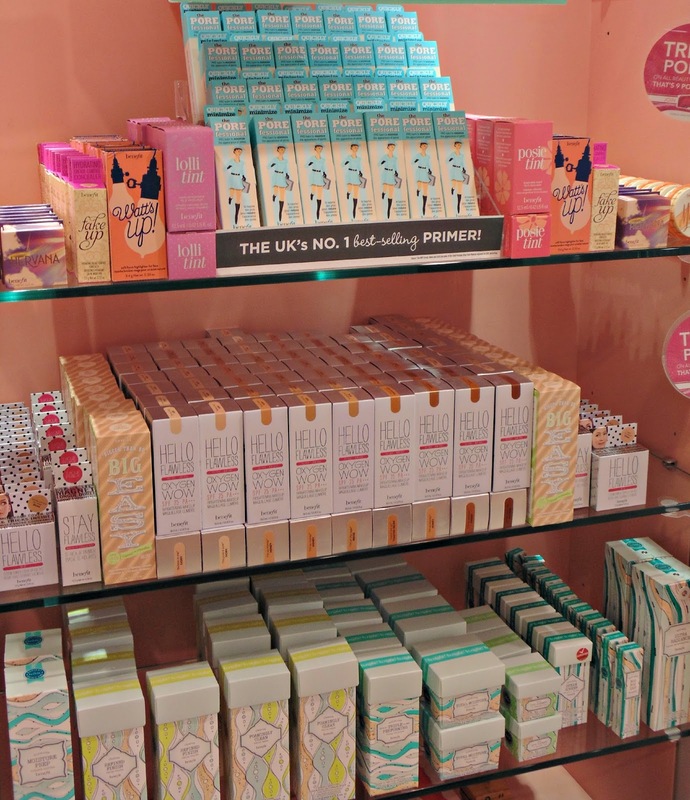 The event was held at the Benefit Boutique in Plymouth Debenhams which is a venue I love- pretty pink wallpaper everywhere with shiny displays and of course beautifully packaged products! Benefit is one of my all time favourite makeup brands so I was thrilled to be invited to this event. 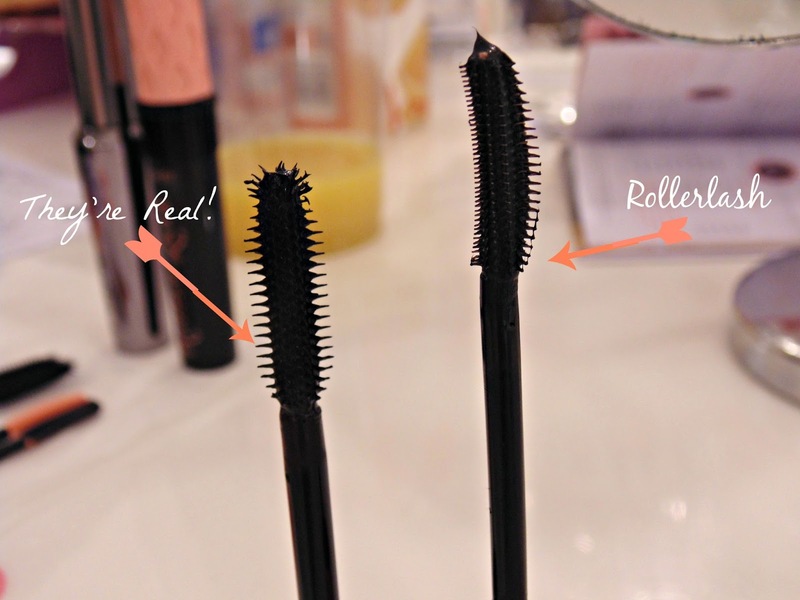 Why have Benefit launched another mascara when they already have the world's fastest selling with 'They're Real!' I hear you ask? I did wonder the same thing. Jasmin (super Benebabe!) 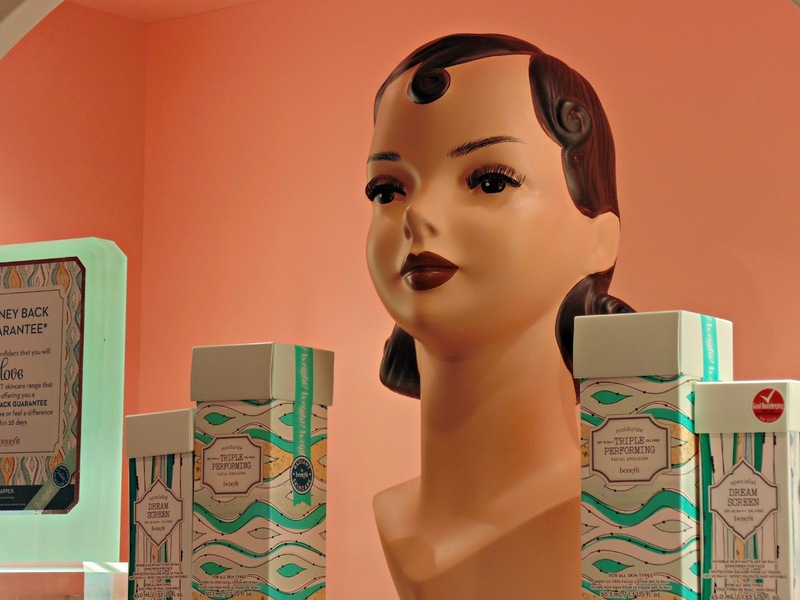 told us all about the characteristics of the new Rollerlash mascara: Its a super-curling and lifting mascara, inspired by retro 50s rollers (aah, I thought the packaging reminded me of something!) with strategically placed hooks on the brush to grab lashes from root to tip whereas They're Real mainly lengthens the lashes. Also the Rollerlash is an ink-black colour whereas They're Real is a more dramatic jet-black, meaning that Rollerlash is definitely more suitable for everyday daytime wear. As much as I love They're Real! 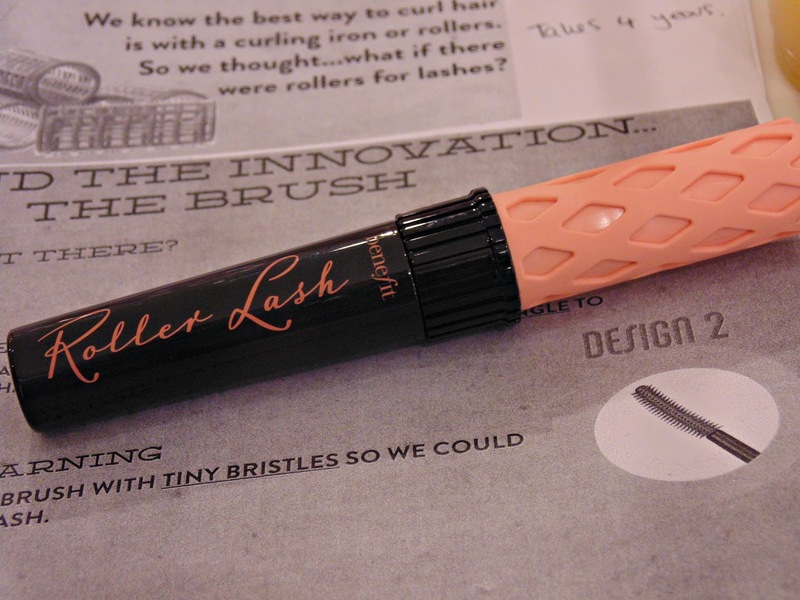 I have to say that Rollerlash has overtaken its rank in my makeup drawer! I'm really into a soft, fluttery lash look so this mascara is perfect for that. And with my stubbornly straight eyelashes it really does give it a great curl without needing to use eyelash curlers which lasts all day! I am thoroughly impressed by Rollerlash. We also had the opportunity to get a famous Benefit Brow Wax! Although I was a little apprehensive beforehand as it was the first time I had got my brows waxed, I was so pleased with the outcome! By mapping and planning the shape to match my face, it gave my brows the perfect arch! I'm so happy with them and will definitely be going back there in the future to maintain my unruly eyebrows! We also received a tour of the mysterious Benefit Boutique backrooms (they're actually tanning and waxing treatment rooms- who knew?!) and we continued the night chatting away about our favourite products, exchanging tips and tricks of the blogging trade. I really do love blogging events and meeting other bloggers who have similar interests to me, its a great community. We were also lucky enough to take home an adorable goody bag full of Benefit treats! I want to say a big thank you to Jasmin and the other Benebabes for making the evening a great one. I can't wait for the next one! Remember to grab your Rollerlash when it lauches on the 28th February for £19.50! Its not a launch that you'll want to miss! Or you can try a sample with this month's issue of Elle magazine. 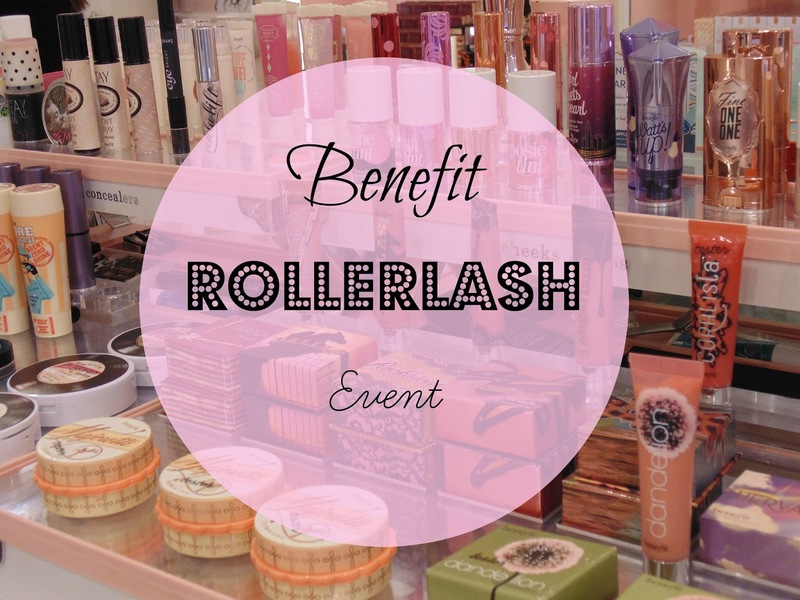 Disclaimer: Benefit invited me to this launch party and kindly provided me with samples of the products mentioned but as always all opinions and thoughts are 100% my own!